What a beautiful day again yesterday, but nothing like it today. We had a great BBQ on Sunday with friends and the family here, sitting outside in the garden. It was gorgeous. I have made a couple of cards using a Kanban set I bought from QVC a little while ago. Now normally I hate toppers and won't use them unless I have to, but these images really took me and I love them. The patterns, colours and images can all be intermixed from the set and of course I have added some distressing to go with them. 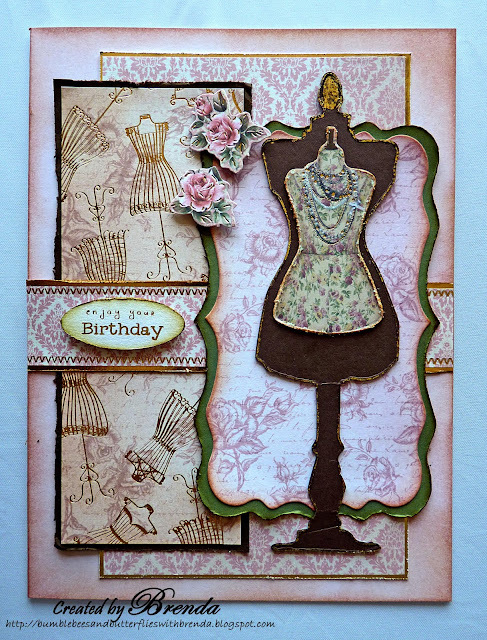 This is the second card I have made, and it's using the sketch this week from Simon Says Stamp. The other card is sitting on a draft blog in Windows Live Writer on my now defunct PC, so I will need to photograph it again and show it to you at some point. 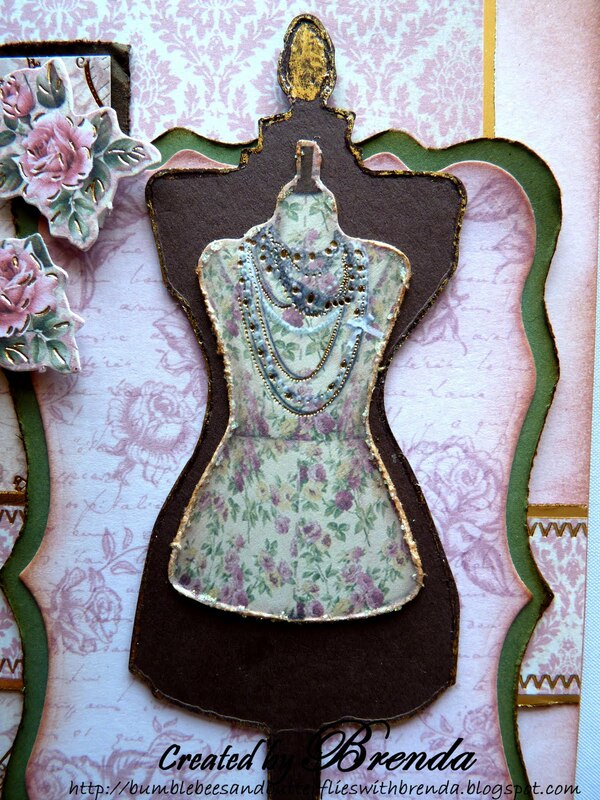 On this one I used the TH dress form die and added gold foiling round the edge using a Zig pen and a roll of gold foil also from QVC. The other things that have come from my stash are some green, brown and gold backing card, all the other elements are from Kanban. Looking good...classic Brenda style! You have such a way with this style. I'll have to check out that gold foil. Glad your weekend went well, with family and friends. Our show was great, but we passed on the nice supper out. I had a stomach flu the night before...why not! My younger granddaughter broke her foot this weekend, just a small bone, but now she's in an air cast for 6 weeks. Some days are diamonds...no? 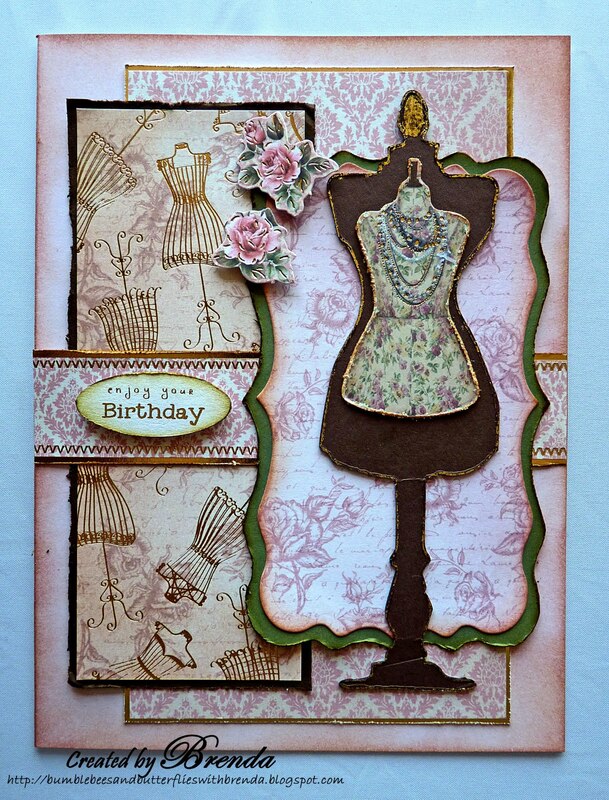 Stunning card Brenda - such fabulous detail. Wow Brenda - what a fabulous card. I thought it had been stamped until I read your Post - the distressing and finishing touches are amazing. Fabulous piece ! Stunningly put together but then again you are the master. Beautifully crafted and very gorgeous indeed. Ooh this is gorgeous Brenda! It looks great with the distressing - beautiful colours and love the effect with the gold foil. This is beautiful - I love the combinations of the browns and dusky pinks - really works well. Oh wow Brenda this is beautiful the image, papers and design look superb I love this so much.